As we know by now, everything that is in this life serves a wise though often hidden purpose – suffering is no exception. Whenever a human soul strays from its pathway and does something unkind, the Universal law of love is broken. Because love never punishes but teaches, the resulting pain and suffering are not intended to be some kind of punishment; they are a way of explaining to the soul the workings of the Universal laws. As mentioned earlier, the human soul creates its own suffering because that way alone it can fulfil the purpose of its existence, which is learning and growing about all aspects of God’s nature and its own. This can only be done through every soul gathering its own experiences. But, for each one of us there eventually comes the moment when we recognise that suffering can provide us with the key for finding our way back home into the reunion with our Source, where all earthly troubles are forgotten and nothing but love and wisdom reign. As we know by now, we are all here to find healing and to become healers, each in their own right. Healing comes when the earthly self puts its Highest Self in charge of its whole being and like a small child trustingly places it into the hands of God. This atonement alone can bring the healing the soul needs to return into the state of being in complete harmony with its Creator. Evolution is the main law of life and therefore it is every soul’s own responsibility to develop and grow. Yet, as up to a point we are allowed the freedom to make our own choices, we can also resist all changes and stagnate. During past ages there have been many souls who, after great numbers of lifetimes in physicality managed to shed their lower earthly selves. They evolved into saintly beings, the same as all of us will be doing one of these days, whose exemplary way of living others are willing to follow. These souls walked the way we are treading now before us, trying to show the rest of us through their behaviour the direction in which the rest of our whole race is meant to move. Although the vibrations emitted by such highly evolved souls are sufficiently refined and they have earned the right to move on to higher learning, for which they are good and ready, out of love for us and our world many for the time being refuse to do so. Instead, they have chosen to join one of the numerous groups of guides and helpers in the world of light, to assist and show the way to as many as possible on the other side of the veil of consciousness that to this day separates our two worlds. White Eagle is one of these gatherings. Whenever a soul procrastinates for too long and continues to insist on avoiding the issues that are meant awaken them from their spiritual slumber, the Universal force takes over in the end. Something unexpected and beyond our control happens to shake us out of our lethargy and complacency. Such events are very aptly called ‘force majeure’, as in the end they propel us forward into tackling the questions we thought we had successfully swept under the carpet, so that they would thus be forgotten forever. This is impossible – for as long as anything remains in the way of our spiritual development, all our problems eventually have to be faced and resolved. And that is how, persistently and relentlessly, the Universe pushes us and our world, the same as all other worlds, forwards and upwards on our predestined evolutionary path. Imperceptibly and constantly, the Earth’s vibrations have always been speeding up. That is why each one of us is presented with the necessity of making a conscious choice of either going with the flow or being left behind. As the human spirit is eternal and indestructible and therefore cannot die, this is not as disastrous as it may sound on the surface. It is merely that those who insist on dragging their feet and refusing to get on with working on changing their character to bring forth the best that is within them, are demonstrating unsuitability for taking part in the new Heaven and Earth that is now beginning to manifest itself on our planet. Meanwhile, the souls who happily get on with their lessons for this lifetime, no matter how difficult and trying they may turn out to be, are fruitfully occupied with doing their share of building and manifesting our new world in their own environment and lives. Those who still insist on acting irresponsibly towards anyone are proving by their very behaviour their unreadiness for continuing their education in a peaceful world. The time is rapidly approaching when disturbers of the peace will no longer be allowed to stand in the way. At the right moment, they will be removed from the Earth in the natural course of events. There is no need for emotionally getting carried away with the notion that this sounds cruel. Instead, bear in mind that the true needs of all God’s children are always met, whatever that may entail. This sorting of the sheep from the goats is an aphorism for the parting of the ways of one section of the human race from the other. There is no doubt in my mind that there is no truth whatever in the final sentence. It is bound to have found its way into the Bible for the benefit of our race in its spiritual infancy, when very few of us were capable of grasping the underlying esoteric higher meaning of the tale of the sheep and goats. We, the mass of people in those days, must have required this kind of deterrent to keep us away from the truth, otherwise teachings of this nature would never have been presented to us. Thanks be to God and the Angels that the veil of ignorance is lifting and the living God within each one of us is coming alive. With the help of this wise one, the Universal Christ, who knows the way of all things and beings, increasing numbers of us are now ready to be guided to the real meaning of anything that may come our way. The Christ Spirit leaves us in no doubt that He loves the whole of His Creation totally and unconditionally, including all of His children of the Earth. 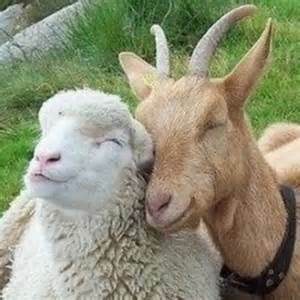 He assures us that souls, the old teachings would have thought of as goats, after having received their initial training in the experiences of life in physicality, will be moving on to help with the colonising of a new planet at the end of their present lifetime – the same as we one did and still are doing with the Earth. The true Christ would never curse or condemn anyone, no matter how deep a soul may have fallen and how depraved it has become. He knows better than anyone else that, to come into its wholeness, every human soul has to gather experiences of all conditions on the Earth plane, before it can begin its journey back home into its real nature. He understands better than anyone else that no birth has ever taken place and no spiritual growth was ever achieved without pain.